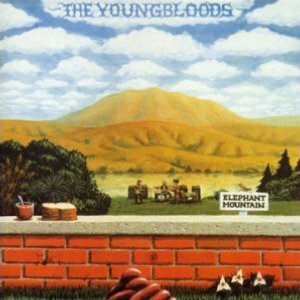 The Youngbloods were a more or less typical hippie band in the late 60s that arose at the same time as bands like the Byrds and Cream. They did a lot of psychadelic and peace & love stuff that I don't particularly like, like the hippie anthem Get Together. There is one song that the Youngbloods produced really stands out from the rest of their work, however, and that song is "Darkness Darkness" from the album Elephant Mountain. Produced by the legendary fiddler Charlie Daniels, who also plays violin in this piece, the song "Darkness Darkness" is open to a lot of different interpretation. It can be a very grim and depressing piece, or it can be simply a cry of weariness. I think of it as a call to sleep to take away the difficulties of the day and fears of tomorrow. No matter how bad a day is and how filled with fear or depression I may be, sleep takes it all away, shutting out my sorrows in sweet oblivion until the next day. Indeed, the first inclination of anyone who is depressed is to sleep, because it takes away the pain. However, this song could also be about death, yearning for the final end to all the pain of life. Calling to death to take you away is something everyone who has faced great sorrow or pain has known as well. The repeated reference to emptiness seems to suggest this as well. During the Vietnam War, this song was especially popular with soldiers, who described it as how they felt while living in constant fear of death and fighting a war they did not understand. Either way, everyone who has lived to adulthood has known moments when they just need to close out the world and escape for a while, just a respite so you can go on. And sleep is an incredible curative, turning the sadness and misery of night into a new day. This song has been covered more than a dozen times by artists ranging from Mott the Hoople, Screaming Trees, and Ann Wilson from Heart to Cowboy Junkies, Golden Earring, and Robert Plant. Ever had a chance to listen to his solo work, California Suite, Grey day? Just a couple songs on Youtube while digging for the video, I like it better than the Youngbloods. I've always thought that Darkness Darkness deals with death and final rest. And yes, it's fantastic, so much better than today's drivel about broken relationships and dancing. Hippie tune or not, I also love Come Together. Nobody sang more sweetly than Jesse Colin Young, and in today's cynical climate, it's easy to forget that so-called hippies really did believe their message of love and peace. I interviewed Jesse Colin Young this morning and he said it was David Lindley who played violin at the start of Darkness Darkness.